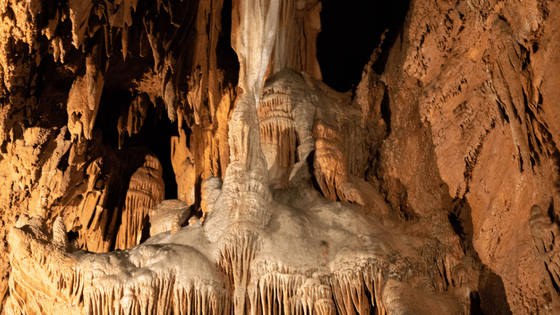 Grand Caverns, now a National Landmark as of 1973, and located in the Shenandoah Valley, was discovered in 1804 by a 17-year-old named Bernard Weyer. Only two years after its discovery, it was open to the public for tours and it is the oldest operating show cave in the U.S. It was also open during the Civil War and both Confederate and Union soldiers visited the caverns- sometimes at the same time! There are even over 200 verified signatures in the cave from those soldiers! The Grand Caverns is found in the Shenandoah Valley in Grottoes, Virginia and is part of the Virginia Civil War Trails. There are also areas for hiking, fishing, family friendly park equipment, spelunking, and a public pool. A characteristic of the cave that sets itself apart from the rest is the amount of shield formations found throughout the cave. These gravity-defying formations remain a mystery to geologists, and there are more to be found at Grand Caverns than any other show cave. The largest room within the show cave is “Cathedral Hall.” The size of the room is 280 ft long and roughly 70 feet high. That makes it one of the largest rooms in all of the Eastern U.S. The cavern is fun for both adults and children. Its tour guides make the experience engaging for even the smallest of children. Our son, the age of 3, was very engaged in the hour-long tour and it was very fun for him to seek out “animals” hidden in the formations of the cavern in an area known as the “Zoo.” This particular room has rock formations that look like various animals such as an alligator, wolf, bear, and other fun finds! It was so much to see our son’s imagination run wild as he explored the cave. Throughout the cave there are also rock formations known as, “George Washington,” the “Bridal Veil,” and “Dante’s Inferno.” These formations had an interesting story relating to the cavern which made it not just fun but also educational. In the 1800’s a section of the cave was used for dancing, it is now known as the “Grand Ball Room.” Dances were held by torch and candle light while musicians played live music in the room. Unwed ladies stood at this “hitching stick” while waiting to be asked to dance. There’s also a room inside the Caverns known as “The Chapel.” In the early years it was a place for wedding ceremonies as well as church gatherings and services. To this day, weddings are still preformed inside this room. The largest room, “Cathedral Hall” holds a rock formation known as, “George Washington’s Tomb.” Before entering the room, this “tomb” appears to be very small. However, it is much larger than you would expect and is one of several optical illusions you will find inside the cave. Throughout the cave you will find pieces left behind of old cave dwelling. In the early years, cave explorers would use a large vase to capture water to drink during their explorations. This water was safe to drink as it had been filtered through the cave rock and collected into the vase. Also in the cave, you will find a ladder that was carried around in 40 lb sections and reassembled to explore hard to get to areas. In 2004, a new section of the Grand Caverns was discovered while surveying the area. Our tour guide explained how a dog named Rosie, actually sniffed it out! Once the cavers began exploring the small crevice, they crawled for about 45 minutes to reach the new territory. It turned into a 3 mile stretch of unexplored cave! The cave operates Monday through Sunday from 9:00AM to 5:00PM. It is not wheelchair or stroller friendly and holds at 54° F all year. Light jackets are recommended as well are walking shoes. There are stairs, small declines and a few slippery spots due to water throughout the cave. If you’re looking for more than a tour you can sign up for the Grand Caverns Adventure Tour. It is for those looking for a more adventurous experience. Helmets, headlights, knee pads, and gloves are provided and participants have to be 12 years of age or older to join in on this adventure! Read about our Family Vacation to the Smoky Mountains here!